So anyway,: Are you my mummy? A trip on a train leads the Doctor and Clara into a situation stickier than George Sampson's stomach. HASHTAG TOPICAL COMEDY! "Mummy on the Orient Express" by Jamie Mathieson, directed by Paul Wilmshurst. Spoilers after the cut. A tourist spaceship that's a replica of the Orient Express is a bit similar to one modeled on the Titanic, but then I can totally buy that that's something that would happen a lot. I was going to say at least this was more plausible than someone trying to sell tickets to a replica of a notorious death trap but... didn't someone actually try to do that a couple of years ago? Although not in space, I'll grant you. 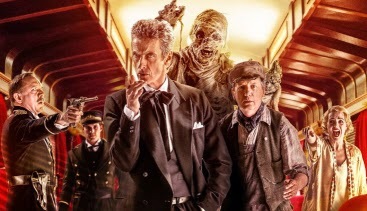 In terns of story if not the Doctor himself "Mummy on the Orient Express" has unmistakeable hints of early Tom Baker-era Doctor Who, with the reinvention of a classic movie monster. Another spooky story that's a good match for Twelve's dark personality, and I'd hazard a guess that scene of the mummy's hand appearing through the Doctor's face will stay with some of the younger children watching for years to come. I also like that the "are you my mummy?" gag was underplayed. Unlike me, who put it in the title. Hey I'm not being paid megabucks to write this, leave me alone.